Will wonders never cease? The Duchess of Cambridge showed up at a reception at the Natural History Museum, of which she is patron, wearing a brand new dress and strappy sandals. And while that may sounds very Kate to some, in fact, I was betting on a recycle given the jewels and cleavage on display at last night’s state banquet. Now, before we turn back to Kate’s sartorial splendor, let’s give the NHM its due. Tonight featured the unveiling of a giant blue whale skeleton called Hope. (That was a weird sentence and I didn’t anticipate having to write it, but here we are.) Hope replaces a beloved figure, “Dippy,” who is, quite naturally, a dinosaur. Or was, as the case may be. Hope’s skeleton dates back to 1891 and has been on display since 1934. The entire spectacle will be open to the public starting at 10 am GMT tomorrow, July 14th. ‘This is a landmark moment for the Museum and for the millions of people from all over the world who visit us. The transformation of Hintze Hall represents a new era for us as a natural history museum for the future. Kate not only graced the reception with her presence, but she also made a speech. And this, my friends, actually is a big deal, because Kate famously hates public speaking. It was nearly a year into her marriage before she made her first speech on behalf of one of her patronages and, since then, they’ve been few and far between, all told. Over the past couple months, however – from live speaking engagements to video interviews – she’s been out there a bit more and she appears to be relaxing into the habit a bit. Kate has received some criticism on this front, for both appearing nervous during her speeches and for doing so few, but none of that is going to come from me. Any number of people are afraid of public speaking and while one could argue that it’s a key part of her job, one would also be wrong on that front. As the wife to the second in line to the throne, it’s just not. It’s nice, sure, but it’s hardly integral. Tonight Kate wore a light blue Preen dress (hence the headline) with a tee-shirt cut on the bodice and a full, pleated skirt that hit just below the knee. This is the first time she’s worn this dress publicly, however it’s certainly not the first time we’ve seen Preen. In one of Kate’s more memorable 2016 looks, she debuted a red cocktail dress during the Cambridges’ tour of Canada last autumn, which won rave reviews. Then, in typical Kate form, we found out she owned the exact dress in black when she wore it to an engagement back in the UK. See, now that is the Kate with whom I am familiar, which is why I was somewhat surprised to see her show up in a new dress 24 hours after the banquet. She completed the look with a pair of wavy strap sandals from Prada, which I thought were also new at first glance, but it turns out we’ve seen them before – or at least a version of them. She wore a black pair with her royal blue Jenny Packham gown last year in India, however given the skirt’s length, they were mostly hidden. Tonight’s are apparently plum, giving the whole look a decidedly summery vibe. My verdict? I love it from head to toe, including the slight curl she’s added to her new shorter haircut. Similar to her look at Wimbledon, Kate looks like she’s embraced a slight “style refresh,” if you will, without sacrificing what she is inherently drawn to. We’ll next see Kate on Monday when she, the Duke of Cambridge and their children land in Warsaw to kick off their tour of Poland and Germany. 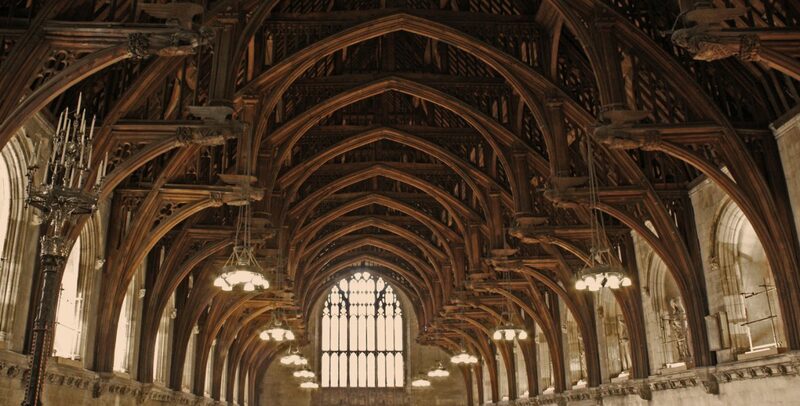 In the meantime, I’m off to cover the Guildhall reception!